Northern Ireland Chamber of Commerce and Industry (NI Chamber) will host this leadership event as part of their Growing Something Brilliant series. 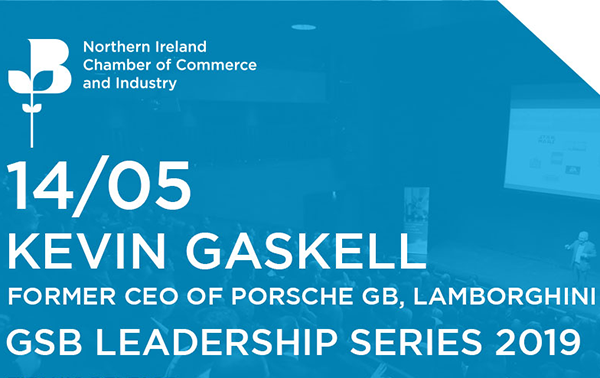 Kevin Gaskell, Former CEO of Porsche GB, Lamborghini GB and BMW GB, will share his own leadership journey. Leading the turnaround of Porsche, from close to bankruptcy to market leader, saw Kevin Gaskell, at the age of 32, recognised as one of the most capable leaders of his generation. Kevin has led global corporations, start-ups, private equity portfolio companies and organisations large and small to create shareholder value in excess of $5Billion. Delegates are encouraged to participate and engage through an open Q&A session. The NI Chamber Growing Something Brilliant (GSB) Leadership Series, in partnership with Electric Ireland, focuses on the importance of inspirational leadership, recognising that strong and effective leaders boost productivity, performance and ultimately organisational success.